Before you take your Mumbai Darshan (Bombay sightseeing) trip, it will be helpful for you to have some knowledge about this city. Mumbai, also called Bombay and Bambai, is the capital of the Indian state of Maharashtra. Mumbai, the most populous city in India, is the second most populous city in the world, with a population of approximately 14 million. Along with the neighbouring urban areas, which includes cities of Navi Mumbai and Thane, it is one of the most populous urban regions in the world. 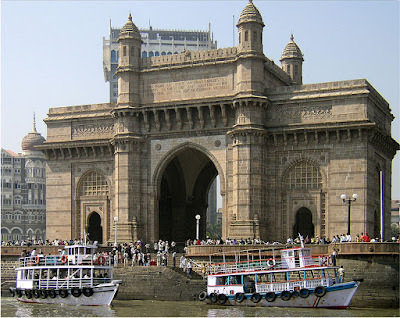 Mumbai lies on the west coast of India and has a deep natural harbour. As of 2009, Mumbai was named an Alpha world city. Mumbai is also the richest city in India. The seven islands that came to constitute Bombay were home to communities of fishing colonies. For centuries, the islands came under the control of successive kingdoms and indigenous empires before being ceded to Portuguese settlers and subsequently to the British East India Company. During the mid-18th century, Bombay was reshaped by the British with large-scale civil engineering projects, aimed at merging all the seven islands into a single amalgamated mass, and emerged as a significant trading town. Economic and educational development characterised the city during the 19th century. It became a strong base for the Indian independence movement during the early 20th century. When India became independent in 1947, the city was incorporated into Bombay State. In 1960, following the Samyukta Maharashtra movement, a new state of Maharashtra was created with Bombay as the capital. It was renamed Mumbai in 1995. Mumbai is the commercial and entertainment centre of India, generating 5% of India's GDP, and accounting for 25% of industrial output, 40% of maritime trade, and 70% of capital transactions to India's economy. Mumbai is home to important financial institutions such as the Reserve Bank of India, the Bombay Stock Exchange, the National Stock Exchange of India and the corporate headquarters of numerous Indian companies and multinational corporations. The city also houses India's Hindi film and television industry, known as Bollywood. Mumbai's business opportunities, as well as its potential to offer a higher standard of living, attract migrants from all over India and, in turn, make the city a potpourri of many communities and cultures. The name Mumbai is an eponym, etymologically derived from Mumba or Maha-Amba—the name of the Koli goddess Mumbadevi—and Aai, "mother" in Marathi. The former name Bombay had its origins in the 16th century when the Portuguese arrived in the area and called it by various names, which finally took the written form Bombaim, still common in current Portuguese use. After the British gained possession of the city in the 17th century, it was believed to be anglicised to Bombay from the Portuguese Bombaim. The city was known as Mumbai or Mambai to Marathi speakers, and as Bambai in Hindi, Persian, and Urdu. It is sometimes still referred to by its older names, such as Kakamuchee and Galajunkja. The name was officially changed to its Marathi pronunciation of Mumbai in November 1995. However, the city is still commonly referred to as Bombay by many of its residents and Indians from other regions as well. Mumbadevi is the temple of local Hindu goddess Mumbadevi, after which the city of Mumbai derives its name. A widespread explanation of the origin of the traditional English name Bombay holds that it was derived from a Portuguese name meaning "good bay". This is based on the fact that bom (masc.) is Portuguese for "good" whereas the English word "bay" is similar to the Portuguese baía (fem., bahia in old spelling). The normal Portuguese rendering of "good bay" would have been boa bahia rather than the grammatically incorrect bom bahia. However, it is possible to find the form baim (masc.) for "little bay" in 16th-century Portuguese. Portuguese scholar José Pedro Machado in his Dicionário Onomástico Etimológico da Língua Portuguesa (Portuguese Dictionary of Onomastics and Etymology), seems to reject the "Bom Bahia" hypothesis, asserting that Portuguese records mentioning the presence of a bay at the place led the English to assume that the noun (bahia, "bay") was an integral part of the Portuguese toponym, hence the English version Bombay, adapted from Portuguese. Mirat-i-Ahmedi referred to the city as Manbai in 1507. The earliest Portuguese writer to refer to the city as Bombaim was Gaspar Correia in 1508, as recorded in his Lendas da Índia ("Legends of India"). Portuguese explorer Duarte Barbosa mentions a reference to the city in a complex form, as Tana-Maiambu or Benamajambu in 1516.Tana appears to refer to the name of the adjoining town of Thane, and Maiambu seems to refer to Mumba-Devi, the Hindu goddess after which the place is named in Marathi. Other variations of the name recorded in the 16th and the 17th centuries are, Mombayn (1525), Bombay (1538), Bombain (1552), Bombaym (1552), Monbaym (1554), Mombaim (1563), Mombaym (1644), Bambaye (1666), Bombaiim (1666), Bombeye (1676), and Boon Bay (1690). The history of Mumbai recounts the growth of a collection of seven islands on the west coast of India, becoming the commercial capital of the nation, and one of the most populous cities in the world. Although human habitation existed since the Stone Age, the Kolis, a fishing community, were the earliest known settlers of the islands. The Maurya Empire gained control of the islands during the 3rd century BCE, and transformed it into a centre of Hindu and Buddhist culture and religion. Later, between the 2nd century BCE and 9th century CE, the islands came under the control of successive indigenous dynasties: Satavahanas, Abhiras, Vakatakas, Kalachuris, Konkan Mauryas, Chalukyas and Rashtrakutas, before being ruled by the Silharas from 810 to 1260. King Bhimdev established his kingdom in the region in the late 13th century, and brought many settlers to the islands. The Muslim rulers of Gujarat captured the islands in 1348, and they were later governed by the Gujarat Sultanate from 1391 to 1534. The Treaty of Bassein between the Portuguese viceroy Nuno da Cunha and Bahadur Shah of the Gujarat Sultanate placed the islands into Portuguese possession in 1534. Charles II of England received possession of the islands in 1661 as part of the dowry of Catherine of Braganza, daughter of King John IV of Portugal, and leased them to the British East India Company in 1668. The islands suffered incursions from Mughals towards the end of the 17th century. During the mid-18th century, the city emerged as an important trading town, with maritime trade contacts with Mecca and Basra. Economic and educational development characterised the city during the 19th century with the first-ever Indian railway line beginning operations between Bombay and neighbouring Thane in 1853. The city became a strong base for the Indian independence movement during the early 20th century and was the epicentre of the Rowlatt Satyagraha of 1919 and Royal Indian Navy Mutiny of 1946. After India's independence in 1947, the territory of Bombay Presidency retained by India was restructured into Bombay State. The area of Bombay State increased, after several erstwhile princely states that joined the Indian union were integrated into Bombay State. In 1960, following protests from the Samyukta Maharashtra movement, the city was incorporated into the dominion of the newly created Maharashtra State from Bombay State. The city's secular fabric was torn apart in the communal riots of 1992–93, while the bombings of 1993 caused extensive loss of life and property. The city was renamed Mumbai in 1996. Mumbai has suffered several terrorist attacks during the 21st century. Geologists believe that coast of western India came into being around 100 to 80 mya after it broke away from Madagascar. Soon after its detachment, the peninsular region of the Indian plate drifted over the Réunion hotspot, a volcanic hotspot in the Earth's lithosphere near the island of Réunion. An eruption here some 65 mya is thought to have laid down the Deccan Traps, a vast bed of basalt lava that covers parts of central India. This volcanic activity resulted in the formation of basaltic outcrops, such as the Gilbert Hill, that are seen at various locations in the city. Further tectonic activity in the region led to the formation of hilly islands separated by a shallow sea. Pleistocene sediments found near Kandivali in northern Bombay by British archaeologist Todd in 1939 indicate habitation since the Stone Age. The present day city was built on what was originally an archipelago of seven islands of Bombay Island, Parel, Mazagaon, Mahim, Colaba, Worli, and Old Woman's Island (also known as Little Colaba). The islands were coalesced into a single landmass by the Hornby Vellard engineering project in 1784. By 1000 BCE, the region was heavily involved in seaborne commerce with Egypt and Persia. The Koli fishing community had long inhabited the islands. They were Dravidian in origin and included a large number of scattered tribes along the Vindhya Plateau, Gujarat, and Konkan. In Bombay, there were three or four of these tribes. Their religious practices could be summed up as animism, and could not be suppressed by the Aryan invaders arriving in 350 BCE. The islands were incorporated into the Maurya Empire under Emperor Ashoka of Magadha in the third century BCE. The empire's patronage made the islands a centre of Hindu and Buddhist religion and culture. Buddhist monks, scholars, and artists created the artwork, inscriptions, and sculpture of the Kanheri Caves in the mid third century BCE and Mahakali Caves. After the decline of the Maurya Empire around 185 BCE, these islands fell to the Satavahanas. The port of Sopara (present-day Nala Sopara) was an important trading centre during the first century BCE, with trade contacts with Rome. The islands were known as Heptanesia (Ancient Greek: A Cluster of Seven Islands) to the Greek geographer Ptolemy in 150 CE. After the end of the Satvahana rule in 250 CE, the Abhiras of Western Maharashtra and Vakatakas of Vidarbha held dominion over the islands. The Abhiras ruled for 167 years, till around 417 CE. The Kalachuris of Central India ruled the islands during the fifth century, which were then acquired by the Mauryas of Konkan in the sixth and early part of the seventh century. The Mauryas were feudatories of Kalachuris, and the Jogeshwari Caves were constructed during their regime between 520 to 525. The Greek merchant Cosmas Indicopleustes visited Kalyan (near Bombay) during 530-550. The Elephanta Caves also dates back to the sixth century. Christianity arrived in the islands during the sixth century, when the Nestorian Church made its presence in India. The Mauryan presence ended when the Chalukyas of Badami in Karnataka under Pulakesi II invaded the islands in 610. Dantidurga of the Rashtrakuta Dynasty of Karnataka conquered the islands during 749-750. The Silhara dynasty of Konkan ruled the region between 810 and 1260. The Walkeshwar Temple was constructed during the 10th century and the Banganga Tank during the 12the century under the patronage of the Silhara rulers. The Italian traveler Marco Polo's fleet of thirteen Chinese ships passed through Bombay Harbour during May — September 1292. King Bhimdev founded his kingdom in the region in the late 13th century and established his capital in Mahikawati (present day Mahim). He belonged to either the Yadava dynasty of Devagiri in Maharashtra or the Anahilavada dynasty of Gujarat. He built the first Babulnath temple in the region and introduced many fruit-bearing trees, including coconut palms to the islands. The Pathare Prabhus, one of the earliest settlers of the city, were brought to Mahim from Patan and other parts of Saurashtra in Gujarat around 1298 by Bhimdev during his reign. He is also supposed to have brought Palshis, Pachkalshis, Bhandaris, Vadvals, Bhois, Agris and Brahmins to these islands. After his death in 1303, he was succeeded by his son Pratapbimba, who built his capital at Marol in Salsette, which he named Pratappur. The islands were wrested from Pratapbimba's control by Mubarak Khan, a self-proclaimed regent of the Khilji dynasty, who occupied Mahim and Salsette in 1318. Pratapbimba later reconquered the islands which he ruled till 1331. Later, his brother-in-law Nagardev for 17 years till 1348. The islands came under the control of the Muslim rulers of Gujarat in 1348, ending the sovereignty of Hindu rulers over the islands. The islands were under Muslim rule from 1348 to 1391. After the establishment of the Gujarat Sultanate in 1391, Muzaffar Shah I was appointed viceroy of north Konkan. For the administration of the islands, he appointed a governor for Mahim. During the reign of Ahmad Shah I (1411–1443), Malik-us-Sharq was appointed governor of Mahim, and in addition to instituting a proper survey of the islands, he improved the existing revenue system of the islands. During the early 15th century, the Bhandaris seized the island of Mahim from the Sultanate and ruled it for eight years. It was reconquered by Rai Qutb of the Gujarat Sultanate. Firishta, a Persian historian, recorded that by 1429 the seat of government of the Gujarat Sultanate in north Konkan had transferred from Thane to Mahim. On Rai Qutb's death in 1429-1430, Ahmad Shah I Wali of the Bahmani Sultanate of Deccan captured Salsette and Mahim. Ahmad Shah I retaliated by sending his son Jafar Khan to recapture the lost territory. Jafar emerged victorious in the battle fought with Ahmad Shah I Wali. In 1431, Mahim was recaptured by the Sultanate of Gujarat. The Sultanate's patronage led to the construction of many mosques, prominent being the Haji Ali Dargah in Mahim, built in honour the Muslim saint Haji Ali in 1431. After the death of Kutb Khan, the Gujarat commandant of Mahim, Ahmad Shah I Wali again despatched a large army to capture Mahim. Ahmad Shah I responded with a large army and navy under Jafar Khan leading to the defeat of Ahmad Shah I Wali. During 1491–1494, the islands suffered sea piracies from Bahadur Khan Gilani, a nobleman of the Bahamani Sultanate. After the end of the Bahamani Sultanate, Bahadur Khan Gilani and Mahmud Gavan (1482–1518) broke out in rebellion at the port of Dabhol and conquered the islands along with the whole of Konkan. Portuguese explorer Francisco de Almeida's ship sailed into the deep natural harbour of the island in 1508, and he called it Bom Bahia (Good Bay). However, the Portuguese paid their first visit to the islands on 21 January 1509, when they landed at Mahim after capturing a Gujarat barge in the Mahim creek. After a series of attacks by the Gujarat Sultanate, the islands were recaptured by Sultan Bahadur Shah. In 1526, the Portuguese established their factory at Bassein. During 1528-29, Lopo Vaz de Sampaio seized the fort of Mahim from the Gujarat Sultanate, when the King was at war with Nizam-ul-mulk, the emperor of Chaul, a town south of the islands. Bahadur Shah had grown apprehensive of the power of the Mughal emperor Humayun and he was obliged to sign the Treaty of Bassein with the Portuguese on 23 December 1534. According to the treaty, the islands of Bombay and Bassein were offered to the Portuguese. Bassein and the seven islands were surrendered later by a treaty of peace and commerce between Bahadur Shah and Nuno da Cunha, Viceroy of Portuguese India, on 25 October 1535, ending the Islamic rule in Bombay. The Portuguese were actively involved in the foundation and growth of their religious orders in Bombay. The islands were leased to Mestre Diogo in 1534. The San Miguel (St. Michael Church) in Mahim, one of the oldest churches in Bombay, was built by the Portuguese in 1540. Parel, Wadala, Sion, and Worli were granted to Manuel Serrão between 1545 and 1548, during the viceroyalty of João de Castro. Mazagaon was granted to Antonio Pessoa in 1547. Salsette was granted for three years to João Rodrigues Dantas, Cosme Corres, and Manuel Corres. Trombay and Chembur were granted to Dom Roque Tello de Menezes, and the Island of Pory (Elephanta Island) to João Pirez in 1548. Garcia de Orta, a Portuguese physician and botanist, was granted the possession of Bombay in 1554 by viceroy Pedro Mascarenhas. The Portuguese encouraged intermarriage with the local population, and strongly supported the Roman Catholic Church. They started the Inquisition in India in 1560, which resulted in forcible conversion to Christianity of the local Koli population in Mahim, Worli, and Bassein. These Christians were referred as Portuguese Christians, who later named themselves as the East Indian Catholics (after the British East India Company) during the British regime. During this time, Bombay's main trade was coconuts and coir. After Antonio Pessoa's death in 1571, a patent was issued which granted Mazagaon in perpetuity to the Sousa e Lima family. The St. Andrew Church at Bandra was built in 1575. The annexation of Portugal by Spain in 1580 opened the way for other European powers to follow the spice routes to India. The Dutch arrived first, closely followed by the British. The first English merchants arrived in Bombay in November 1583, and travelled through Bassein, Thane, and Chaul. The Portuguese Franciscans had obtained practical control of Salsette and Mahim by 1585, and built Nossa Senhora de Bom Concelho (Our Lady of Good Country) at Sion and Nossa Senhora de Salvação (Our Lady of Salvation) at Dadar in 1596. The Battle of Swally was fought between the British and the Portuguese at Surat in 1612 for the possession of Bombay. Dorabji Nanabhoy, a trader, was the first Parsi to settle in Bombay in 1640. Castella de Aguada (Fort of the Waterpoint) was built by the Portuguese at Bandra in 1640 as a watchtower overlooking the Mahim Bay, the Arabian Sea and the southern island of Mahim. The growing power of the Dutch by the middle of the seventeenth century forced the Surat Council of the British Empire to acquire Bombay from King John IV of Portugal in 1659. The marriage treaty of Charles II of England and Catherine of Portugal on 8 May 1661 placed Bombay in British possession as a part of Catherine's dowry to Charles. On 19 March 1662, Abraham Shipman was appointed the first Governor and General of the city, and his fleet arrived in Bombay in September and October 1662. On being asked to hand over Bombay and Salsette to the English, the Portuguese Governor contended that the island of Bombay alone had been ceded, and alleging irregularity in the patent, he refused to give up even Bombay. The Portuguese Viceroy declined to interfere and Shipman was prevented from landing in Bombay. He was forced to retire to the island of Anjediva in North Canara and died there in October 1664. In November 1664, Shipman's successor Humphrey Cooke agreed to accept Bombay without its dependencies. However, Salsette, Mazagaon, Parel, Worli, Sion, Dharavi, and Wadala still remained under Portuguese possession. Later, Cooke managed to acquire Mahim, Sion, Dharavi, and Wadala for the English. On 21 September 1668, the Royal Charter of 27 March 1668, led to the transfer of Bombay from Charles II to the British East India Company for an annual rent of £10 (equivalent retail price index of £1,226 in 2007). The Company immediately set about the task of opening up the islands by constructing a quay and warehouses. A customs house was also built. Fortifications were built around Bombay Castle. A Judge-Advocate was appointed for the purpose of civil administration. George Oxenden became the first Governor of Bombay under the British East India Company on 23 September 1668. Gerald Aungier, who was appointed Governor of Bombay on July 1669, established the first mint in Bombay in 1670. He offered various business incentives, which attracted Parsis, Armenians, Jews, Dawoodi Bohras, Gujarati Banias from Surat and Diu, and Brahmins from Salsette. He also planned extensive fortifications in the city from Dongri in the north to Mendham's Point (near present day Lion Gate) in the south. The harbour was also developed during his governorship, with space for the berthing of 20 ships. In 1670, the Parsi businessman Bhimjee Parikh imported the first printing press into Bombay. Between 1661 and 1675 there was a sixfold increase in population from 10,000 to 60,000. Yakut Khan, the Siddi admiral of the Mughal Empire, landed at Bombay in October 1672 and ravaged the local inhabitants there. On 20 February 1673, Rickloffe van Goen, the Governor-General of Dutch India attacked Bombay, but the attack was resisted by Aungier. On 10 October 1673, the Siddi admiral Sambal entered Bombay and destroyed the Pen and Nagothana rivers, which were very important for the British and the Maratha King Shivaji. The Treaty of Westminster concluded between England and the Netherlands in 1674, relieved the British settlements in Bombay of further apprehension from the Dutch. In 1686, the Company shifted its main holdings from Surat to Bombay, which had become the administrative centre of all the west coast settlements then. Bombay was placed at the head of all the Company's establishments in India. Yakut Khan landed at Sewri on 14 February 1689, and razed the Mazagon Fort in June 1690. After a payment made by the British to Aurangzeb, the ruler of the Mughal Empire, Yakut evacuated Bombay on 8 June 1690. The arrival of many Indian and British merchants led to the development of Bombay's trade by the end of the seventeenth century. Soon it was trading in salt, rice, ivory, cloth, lead and sword blades with many Indian ports as well as with the Arabian cities of Mecca and Basra.. By 1710, the construction of Bombay Castle was finished, which fortified the islands from sea attacks by European pirates and the Marathas. By 26 December 1715, Charles Boone assumed the Governorship of Bombay. He implemented Aungier's plans for the fortification of the island, and had walls built from Dongri in the north to Mendham's point in the south. He established the Marine force, and constructed the St. Thomas Cathedral in 1718, which was the first Anglican Church in Bombay. In 1728, a Mayor's court was established in Bombay and the first reclamation was started which was a temporary work in Mahalaxmi, on the creek separating Bombay from Worli. The shipbuilding industry started in Bombay in 1735 and soon the Naval Dockyard was established in the same year. In 1737, Salsette was captured from the Portuguese by Maratha Baji Rao I and the province of Bassein was ceded in 1739. The Maratha victory forced the British to push settlements within the fort walls of the city. Under new building rules set up in 1748, many houses were demolished and the population was redistributed, partially on newly reclaimed land. Lovji Nusserwanjee Wadia, a member of the Wadia family of shipwrights and naval architects from Surat, built the Bombay Dock in 1750, which was the first dry dock to be commissioned in Asia. By the middle of the eighteenth century, Bombay began to grow into a major trading town and soon Bhandaris from Chaul in Maharashtra, Vanjaris from the Western Ghat mountain ranges of Maharashtra, Africans from Madagascar, Bhatias from Rajasthan, Vaishya Vanis, Goud Saraswat Brahmins,Daivajnas from konkan, ironsmiths and weavers from Gujarat migrated to the islands. In 1769, Fort George was built on the site of the Dongri Fort and in 1770, the Mazagaon docks were built. The British occupied Salsette, Elephanta, Hog Island, and Karanja on 28 December 1774. Salsette, Elephanta, Hog Island, and Karanja were formally ceded to the British East India Company by the Treaty of Salbai signed in 1782, while Bassein and its dependencies were restored to Raghunathrao of the Maratha Empire. Although Salsette was under the British, but the introduction of contraband goods from Salsette to other parts of Bombay was prevented. The goods were subjected to Maratha regulations with respect to taxes and a 30% toll was levied on all goods into the city from Salsette. In 1782, William Hornby assumed the office of Governor of Bombay, and initiated the Hornby Vellard engineering project of uniting the seven islands into a single landmass. The purpose of this project was to block the Worli creek and prevent the low-lying areas of Bombay from being flooded at high tide. However, the project was rejected by the British East India Company in 1783. In 1784, the Hornby Vellard project was completed and soon reclamations at Worli and Mahalaxmi followed. The history of journalism in Bombay commenced with publication of the Bombay Herald in 1789 and the Bombay Courier in 1790. In 1795, the Maratha army defeated the Nizam of Hyderabad. Following this, many artisans and construction workers from Andhra Pradesh migrated to Bombay and settled into the flats which were constructed by the Hornby Vellard. These workers where called Kamathis, and their enclave was called Kamathipura. The construction of the Sion Causeway (Duncan Causeway) commenced in 1798. The construction of the Sion Causeway was completed in 1802 by Governor Jonathan Duncan. It connected Bombay Island to Kurla in Salsette. On 17 February 1803, a fire raged through the town, razing many localities around the Old Fort, subsequently the British had to plan a new town with wider roads. On May 1804, Bombay was hit by a severe famine, which led to a large scale emigration. On 5 November 1817, the British East India Company under Mountstuart Elphinstone defeated Bajirao II, the Peshwa of the Maratha Empire, in the Battle of Kirkee which took place on the Deccan Plateau. The success of the British campaign in the Deccan witnessed the freedom of Bombay from all attacks by native powers. India is famous its culture in the worlds. It is multi culture and multi religious country from ancient. There are many shrines in each part of India. Bassein (Vasai) ,Tarapur and Mahim forts are built by Portuguese and not British . Nice details of Mumbai with history. Get Boston to New York Bus Tickets and Lowest Price on all NY to West Chester Bus Reservations.Find Intercity Bus Schedule, Routes and Fares.